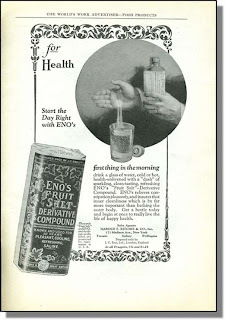 This is a 1924 Ad for Enos Fruit Salt Compound. In other words, Epsom Salts to be used as a laxative. If you think about the context of the ad, 1924 was right in the middle of the boom years of the 1920's. Meals were meat heavy and most vegetables were potatoes, corn, carrots and beans which may have a fiber content but are also starchy and liable to cause constipation. I've found a few of these ads for salt compounds or milk of magnesia but I thought this one was funny since it says "Internal cleanliness is as important and washing the outer body." My wife tells me that quite often as she tells me I need to "Wash my intestines" after eating gassy foods. Times have changed since this ad. Today we are more focused on fiber as a natural laxative rather than dropping depth charges into our gut in order to relieve constipation. I find the older ads interesting as they usually were rather verbose on their scientific findings and medical hoopla all designed to entice you to buy their product. In a way, little has changed in the passing of 90 years. Only today medical science wants to convince you of what pills to take. Just remember that in the same years as this ad was printed medical science sold us diet pills that were "Totally safe and acceptable" but contained Arsenic and Strychnine... Maybe doctors don't know everything after all?